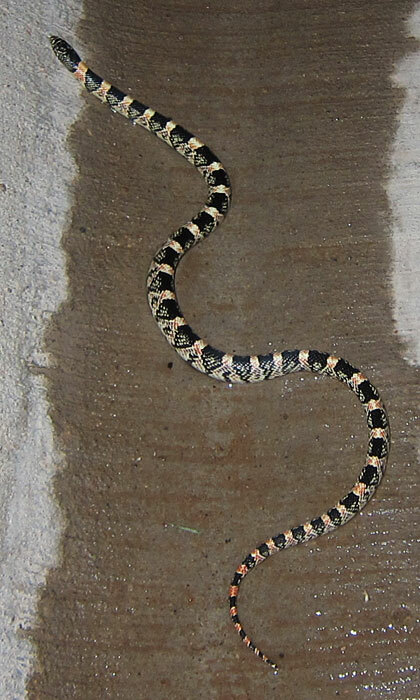 Debbie went outside just before 10:00 p.m. last night to look at the "Supermoon" and came back to report that two women were in the street in front of our house watching what they feared might be a "baby rattlesnake." I grabbed a flashlight - which proved unnecessary because the reptile was directly under our street lamp, and also because the moon was living up to its advanced billing - and immediately recognized that it was not a dangerous species (other than possibly causing a heart attack in the unwary night time dog walker). The snake was only about 12" long, and wasn't happy to be in our company, as it did its best to get away. However, I confess that I don't know for sure what kind of snake it was. My first guess was a juvenile bull snake, simply because we have so many of them in this area. The head is not as thick as I would have expected, but I really haven't seen enough young ones to know for sure. 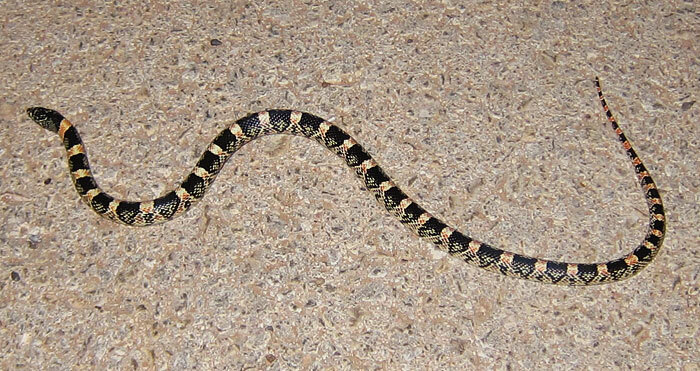 After googling it, I think it also bears a close resemblance to a king snake, but I don't know if they range into our part of the state. Update: Our resident habitat expert, Burr Williams, says that this is a long-nosed snake. It will eat lizards, but not, unfortunately, rats. I took a few photos and allowed the youngster to slither down the gutter toward the park. With any luck, he'll get big enough to take care of some of the cotton rats that are coming into the neighborhood in search of water. This page contains a single entry by Eric published on June 23, 2013 2:59 AM. More Nest Peeping: Barn Swallows was the previous entry in this blog. Barn Swallow Feeding Video is the next entry in this blog.